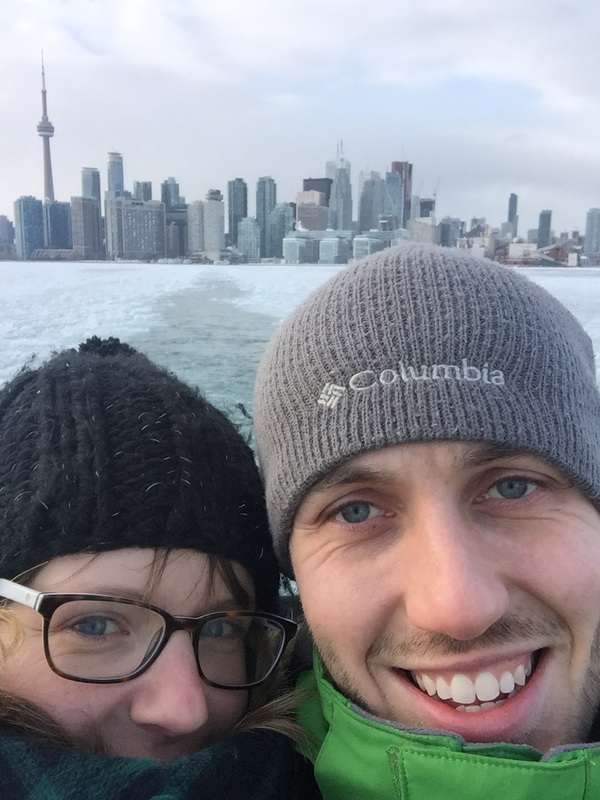 Last weekend was Family Day weekend in Ontario (and in some other provinces), so we headed down to the Toronto Islands. 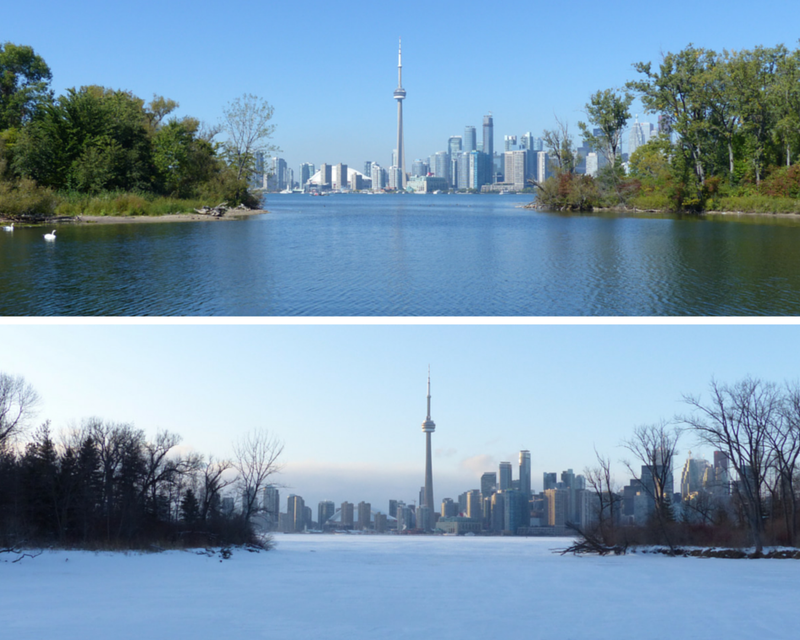 Anyone in Toronto will know that it was very cold last weekend with temperatures reaching as low as -40 with windchill on Sunday!! We went on Saturday, as despite not being forecast to be as sunny as Sunday or Monday, it was due to be a bit ‘warmer’. You can tell how cold it was, as when I returned to to work on Tuesday, my Canadian colleagues (who should be used to these temperatures) promptly told me that we were lunatics for having visited the islands over the weekend! They’re such wimps! 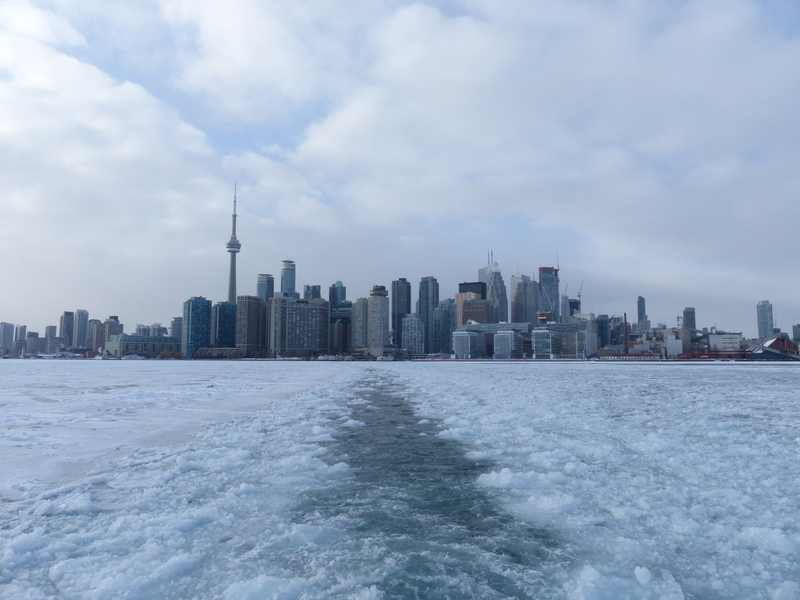 There’s some serious ice on the surface of Toronto Harbour. Don’t know why we paid for the ferry, could have just walked. At this time of year, everything on the islands is closed, including bicycle hire, amusement park, farm, etc. I’m sure that there is nothing stopping you from visiting the beach, but you’re more likely to get frostbite rather than sunburnt! We’d been to the Islands once before, back in September on our 2nd day in Canada. Back then it was warm and sunny t-shirt weather, and we discussed how we might get some ice cream once back on the mainland. This time ice cream was the last thing on our mind as we shivered our way around the islands. 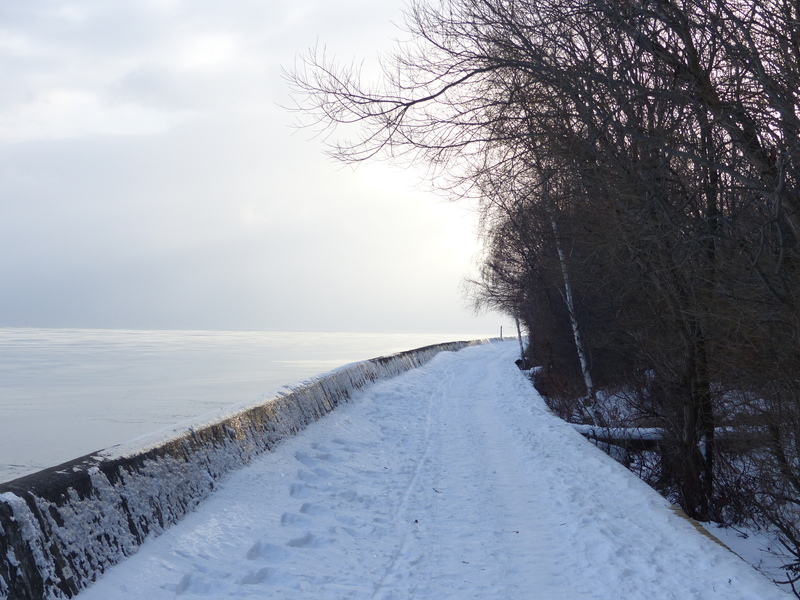 The rickety sounding boardwalk on the Lake Ontario side of the islands that we had cycled along in September was now covered in a thick blanket of snow. 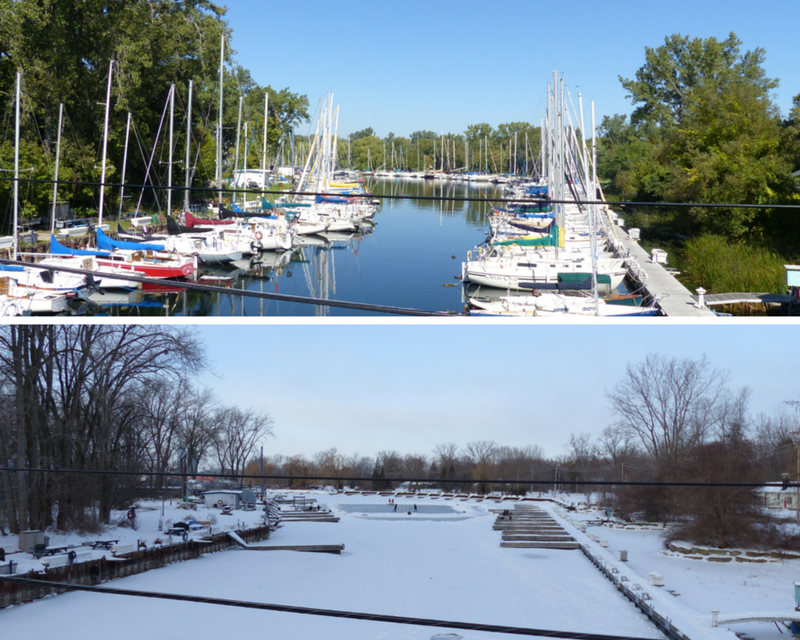 The marina that we had looked at in September was now frozen over and turned into a temporary ice rink. 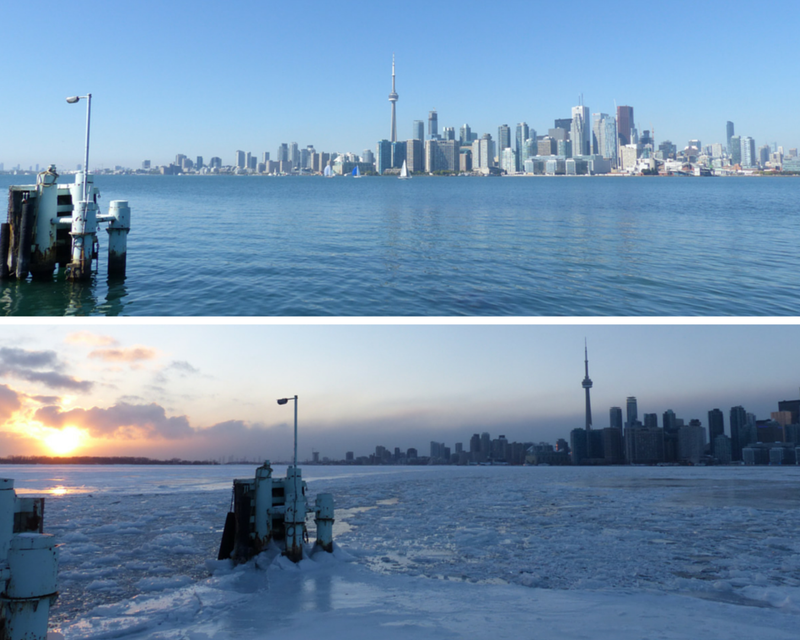 The view we had of an inlet complete with gliding swans was now replaced by a frozen over Toronto Harbour covered in snow. What a difference! Back in sunny September all the boats were out. In February the water is frozen over and an ice hockey game is taking place where boats once sailed. The scene in February looks almost apocalyptic compared to the view in September. Back in September it might have been lovely and warm, but we didn’t get a pretty sunset. Perhaps this doesn’t sound very enjoyable. Well, my fingers have never hurt so much having been buffeted by -20 winds as I took some photos, and my camera got so cold that it got all slow and started making funny noises (it works fine now it’s thawed out). So yes, there were some less enjoyable parts. But in the end it was worth it, because it’s not every day you get a view over frozen water, and being able to contrast it with our previous experience was very cool (no pun intended)! We certainly wouldn’t be cycling along the boardwalk this time! 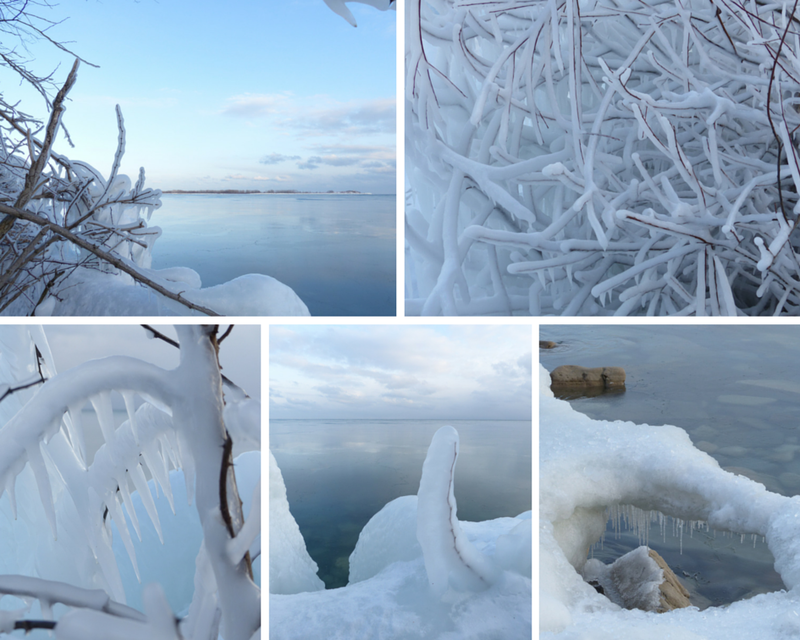 We saw many weird and wonderful frozen shapes on the Lake Ontario side of the Toronto Islands. Amongst our favourites was the phallic shaped ice in the central photo above! I also think it was worth it for the ferry ride over and back. The ferry costs $7 each, and you feel like you are on an icebreaker ship as big chunks of ice are forced away from and under the boat. 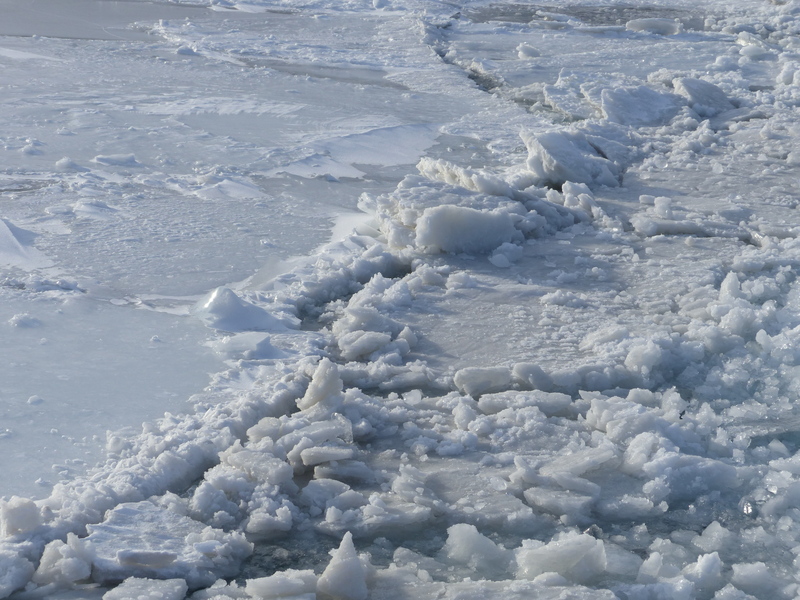 If the ferry slightly deviates from its previous paths, you can also watch as it cracks out more of the ice sheet. You don’t get that experience in the summer! The freezing temperatures are worth it for views like this. We wrapped up warm, Emma in particular, for our freezing afternoon out. Besides the usual tourist attractions, Woodbine Beach is a good place to go at this time of year as Winter Stations is on until April 1st. These are lifeguard stations turned into interactive art installations. The Beaches neighbourhood is cool too, and the streetcar ride along Queen Street East is one of the nicest in the city. The ROM has a Viking exhibition on until April 2nd, while the AGO has the cool looking Infinity Mirrors exhibition. Tickets for that are sold out right now, and don’t go back on sale until March 27th, although a small number are available each day on-site. Allan Gardens Conservatory has a spring flowers exhibition. It’s free, and also dry and warm if the weather is bad! If you are able to head out of the city at all, then snow tubing at somewhere like Snow Valley in Barrie is fun, or a maple syrup festival such as the one in Stouffville.